We created a new website for World Press Photo, an iconic organisation that promotes photo-journalism and filmmaking. Founded in 1955 the organisation had a lot of history and heritage we had to keep in mind. the site was launched for the announcement of the 2019 World Press Photo nominees. Basically everyone knows organisation from the annual World Press Photo contest that highlights the best of photo journalism each year. What most people don’t know is that World Press Photo also runs a contest in digital storytelling and interactive media. They have several talent programs like the Joop Swart Masterclass and the 6x6 Global Talent Program, where they select 6 talented individuals from 6 continents to train and mentor. Recently they started an annual festival in Amsterdam to announce winners and invite guest speakers. This was recently opened up for the public as well. Our goal was to educate people about the work the organisations is doing, while keeping in mind that most of their audience is looking for a way to browse through their imagery and annual contest winners. 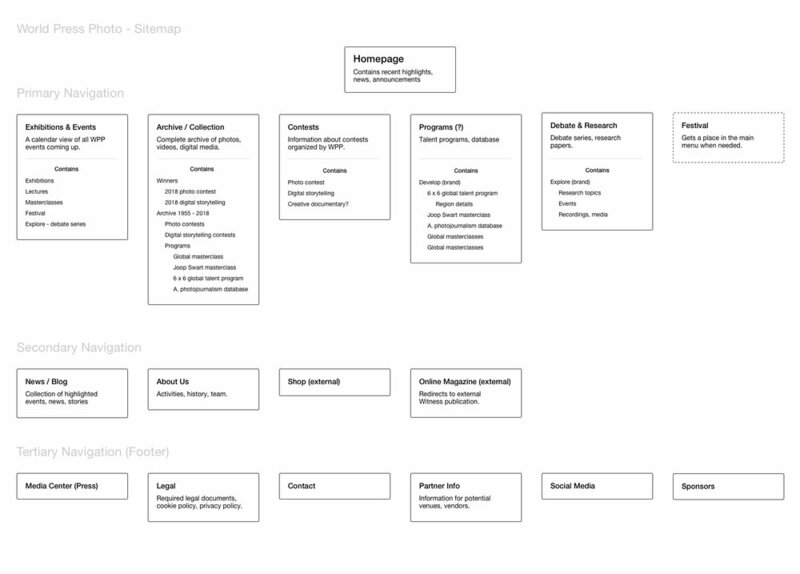 To solve this problem we set up a design sprint with the client to create the menu structure and navigation. Images from our design sprint where we discussed navigation and entry point for the different programs they have. We tested the concept with four participants to see where we had to improve. The general consensus was that their in-house brands, Witness (an online magazine), Debate (a meetup centered around discussing important topics) and Develop (their educational program) had confusing names for navigation. The decision was to group these items under a parent navigation items, so we had space the explain these brands. We wanted to hand them a design system they can extend and manage. Templates and components they could reuse for next years contest winners and any future endeavours. To create the system I’ve identified a set of components that can be used for various use cases and work well on desktop and mobile devices. Probably the most important page for the project was the Archive and the Photo Detail Page. World Press Photo has an archive going back to 1955 containing individual stories and collections as well. For ideation I took inspiration from how images are laid out in photo exhibitions. The rest of the pages were designed to be simple and flexible. When it was possible I tried reusing components from the content section to stay consistent with the rest of the pages. A calendar view was also created for upcoming exhibitions and events.